The Netherlands Open Air Museum is a one-of-a-kind museum that gives the Dutch and visitors from abroad a unique view of the long history of the country and its people. The “Canon of the Netherlands” is the latest and most ambitious attraction. Built entirely indoors and partially submerged inside a giant egg-shaped dome structure, the Canon of the Netherlands transports visitors from the Stone Age to the present through a series of state-of-the-art, multimedia vignettes. Local AV design and integration firm Rapenburg Plaza worked with the Open Air Museum to make the exhibit successful, relying on 44 channels of Ashly Audio fully networked and DSP-enabled amplification. 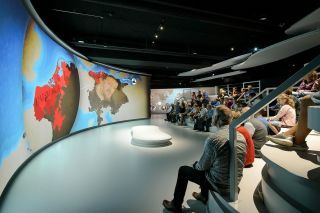 The Canon of the Netherlands is divided into several sections, and within each section, several displays transport visitors through space and time using innovative audiovisual technologies. An entry zone includes 10 uniquely shaped screens, each with its own KEF Ventura 6 loudspeaker powered by its own channel of an Ashly nXp 1504 four-channel 150W multimode network amplifier with onboard DSP. In addition, four 100V Yamaha VXS10ST subwoofers add low-end support where needed and get their power and processing from an Ashly Pema 4250.10 four-channel 250W network amplifier with a built-in Protea matrix DSP. The second section also includes 10 presentations, each supported by varying numbers of 6-ohm KEF Ventura 4 loudspeakers. In all, the second section uses 19 channels via five four-channel Ashly nXp 1504 amplifiers. “Many of the displays required wiring two loudspeakers in parallel,” said Wilfred de Zoete, sound control and sound engineer at Rapenburg Plaza. “The Ashly nXp Series can handle the 3-ohm load and very long cable runs that were unavoidable.” Finally, the “Canon” video wall concludes the experience for visitors. Two more Ashly nXp 1504 amplifiers deliver eight discrete channels of amplification to drive as many KEF Ventura 6 loudspeakers. Soundscapes fill the space and elevate the experience. “The Ashly nXp 1504s are all used in different zones but with the same KEF Ventura 4 and 6 loudspeakers,” de Zoete said. “They give us the flexibility of a low-impedance setup and 150W per channel—ample power for this application. In installations such as this, there is no need for super high-power amplifiers. That is a benefit of the Ashly product line. In addition to the high-power amplifiers common to other manufacturers, Ashly also offers fully featured low-power versions. Thus, the client is not paying for extra output that will never be used. The fact that the nXp 1504 is just 1 RU gives the large system a small footprint.